I believe today, many hear the word "cheap" and automatically think: inferior, stinginess, no value. 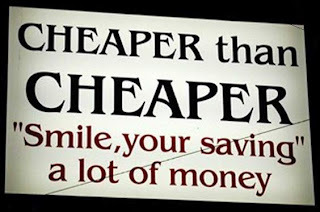 In fact I think the word: Cheap has a bum rap! * What is cheap about living within your means? and you have to live differently and more purposely due to those changes? * What is cheap about voluntarily wanting to simplify your life - on a permanent basis? 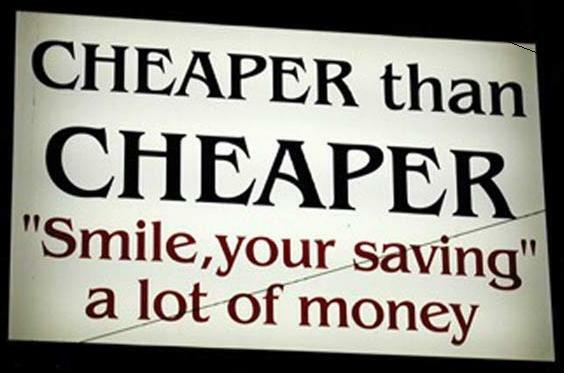 Cheap is as simple as it gets. Trying to live on a unemployed budget or a under-paid budget is not easy to do. In fact I admire those who can live simply, and be as happy or happier than those who have. I believe living simple, buying cheap (not necessarily inferior) recycling, living purposely is American. That is a precious legacy, past generations have handed down to us. That American way of hard work, making do with what we have, and still living a good life.That is how America became America! I think we have forgotten. These recent times, many of us are seeing family, friends and neighbors having to make changes. If we are not part of that (yet) we don't quite understand, all that is involved and in many ways, we may even pity those who are experiencing their bad time. Don't pity - take notes instead. You never know, when "your-time" will come. That is so true, we never know when our time may come when financial circumstances change. A former pastor of ours gave great advice regarding money (he heard it from somewhere else but of course I can't remember who that was now to give the credit to) but he said for every 10 dollars you earn, save 1 dollar of it and give 1 dollar away (to church or some other organization) and learn to live on the 8 remaining dollars. I think if we did that and started to do it early in life when we get our first paycheck and learn to be content with what we have, it would have saved a lot of the mess that a lot of people are in this day with lots of credit card bills, etc. I really have enjoyed lessons learned in our change of lifestyle over the past year and if our financial circumstances improve, I plan to still keep the things we are doing now in the future to get a little bit ahead instead of always being behind.